In 2015, 47 motorcyclists died in traffic in the Netherlands. After 2009, when their number was approximately 1,300, it has not been possible to reliably determine the number of serious road injuries due to poor registration. In the Netherlands 1,4 million people have a motorcycle licence, but as there are 656,000 registered motorcycles, less than half own a motorcycle. These motorcyclists travel an average 1,200 to 3,400 km per year, which means that most do not really build a routine. Between 2010 and 2014, the risk of a fatal traffic crash (per distance travelled) was 30 times higher for motorcyclists than it was for drivers. In 2015, nearly 30% of the road deaths among motorcyclists was between 40 and 49 years-of-age and 98% were male. Approximately 40% of all serious and fatal motorcycle crashes in the Netherlands are single vehicle crashes (a crash in which no other road user is involved). In the other motorcycle crashes the crash opponent is mainly a passenger car. The condition of the vehicle and of the road play a demonstrable role in only in a small part of the motorcycle crashes. The actual role of speed is in the occurrence and impact of motorcycle crashes in the Netherlands has not been investigated. Foreign studies suggest that speed is a more important crash factor in motorcycle crashes than in car crashes. The visibility and conspicuity of motorcyclists also plays a role in motorcycle crashes. Fluorescent clothing and lighting can improve the visibility of motorcyclists, but above all it is the contrast with the environment that benefits the safety of motorcyclists. Clothing also plays a role in the outcome of motorcycle crashes. In the case of a motorcycle crash the motorcycle helmet and suitable motorcycle clothing protect the motorcyclist from injuries. In Netherlands nearly all motorcyclists wear a helmet and motorcycle clothing. To further increase the safety of motorcyclists the technical/intelligent vehicle developments for the car are followed with interest. However, as yet it is not easy to adapt ITS systems for the car to motorcycle use. The use of ABS (antilock braking system) on motorcycles did probably reduce the number of motorcycle crashes. Education can also have positive effects: a study into the one-day advanced riding course (VRO) of the Dutch Motorcycle Association (KNMV) has shown that it has a positive effect on safe riding and hazard perception of motorcyclists. However, the majority of the evaluations of advanced rider training for motorcyclists found no effect on crash involvement and offences. How many fatalities and serious road injuries are there among motorcyclists in the Netherlands? In 2015 there were 47 road deaths among motorcyclists, 7.6% of the total number of road deaths (621) in the Netherlands in 2015. 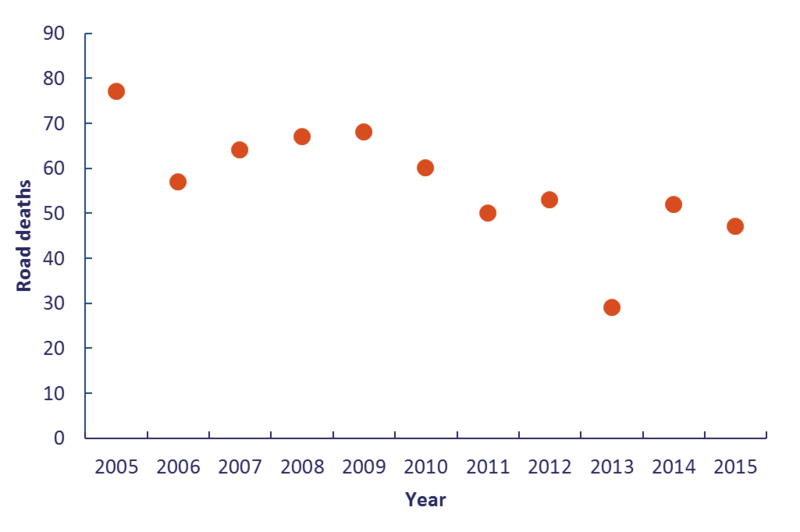 The number of road deaths among motorcyclists fluctuates (Figure 1), but, overall, this number has been declining. Over the past 10 years the number of road deaths among motorcyclists declined with an average of 4.5% per year. The number of serious road injuries among motorcyclists in 2015 is unknown. Since 2009, when their number was about 1,300, it has not been possible to reliably determine this number (see also SWOV Fact sheet Serious road injuries in the Netherlands). How much are motorcycles used in the Netherlands? Approximately 1.4 million people in the Netherlands have a motorcycle licence (2016; source: RDW), but less than half of these own a motorcycle: there are 656,000 registered motorcycles. On average these motorcycle owners travel 1,200 to 3,400 km per year (assuming 0.8 or 2.2 billion kilometres travelled[i] / 656,000 motorcycles respectively). As on average a motorcyclist travels only few kilometres per year, he or she hardly builds up routine. In 2016, almost 70% of the registered motorcycles in the Netherlands were owned by persons between 30 and 59 years-old (Figure 2). Compared to other European countries the Netherlands is in the middle bracket concerning the possession of motorcycles: in 2016, there were almost 39 motorcycles per 1,000 inhabitants in the Netherlands. 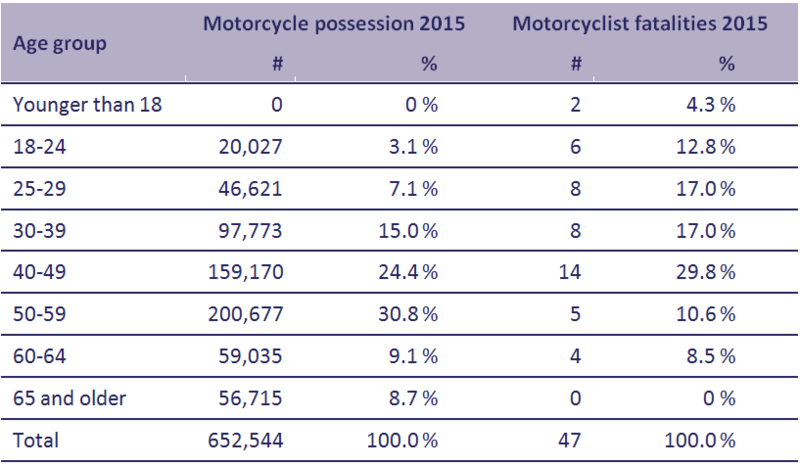 [ii] Of all European counties motorcycle possession is highest in Greece with 100 motorcycles per 1,000 inhabitants; in Bulgaria motorcycle possession is lowest with 9 motorcycles per 1,000 inhabitants . Figure 2. Motorcycle possession in the Netherlands by age of the owner, cylinders and cylinder capacity. Source: CBS (1 January 2017). [i] There are different series of data on the annual distance travelled by motorcyclists. According to the mobility surveys OVG/MON/OViN the kilometres travelled by motorcycles decreased from 1.8 billion km in 1993 to around 0.8 billion km in 2015. According to a Panel Survey of the CBS, on the other hand, the distance travelled by motorcyces in this period increased from 1.3 to 2.2 billion km . Although these estimates vary greatly, the share of the motorcycle in the number of kilometres travelled can be estimated at a maximum of one and a half percent. When are you allowed to ride a motorcycle in the Netherlands? One needs an A licence to ride a motorcycle. Since the introduction of the third licence directive (19 January 2013)  the motorcycle licence is subdivided into three categories : A1 (for light motorcycles), A2 (for medium motorcycles) and A (for all motorcycles). Motorcyclists under the age of 20 years old obtain the A1 licence after having passed the theory test and two practical tests[i] successfully. The A1 licence, allows them to ride a light motorcycle with a cylinder capacity up to 125 cc (maximum power of 11 kilowatts [kW]). For more information see the (archived) SWOV Fact sheet Category A1 (to 125 cc) of the new motorcycle driving licence. From the age of 20 years-old motorcyclists who have the A1 licence can obtain the licence for a medium duty motorcycle (A2 licence; maximum power of 35 kW), by passing an additional practical exam. After 2 years in the possession of the A2-motorcycle license an additional practical exam can be taken to obtain the license for a motorcycle with unlimited power (A). Taking the exam for A2 or for A directly (via the theory test and the two practical tests[i]) is also possible, provided that the minimum age for that category is reached. For A2 this is 20 years old and for A this is 24 years old. More info on the motorcycle licence and the legal requirements can be found at the site of the CBR or the national Government (both in Dutch). [i] The practical tests consist of one initial test vehicle control (AVB; this certificate has a validity of one year) followed by a traffic participation test (AVD). What is the risk for motorcyclists in traffic in the Netherlands? The risk for motorcyclists to sustain fatal or serious injury is large in comparison with other transport modes. In the Netherlands about 65 motorcyclists per billion kilometres travelled died in the period 2010-2014 and about 1,000 were seriously injured (2005-2009[i]; see Figure 3). This means that the fatality rate is similar to that of (light) moped riders and many times higher than that of other modes of transport. Between 2010 and 2014, the risk of a fatal crash was 30 time higher for motorcyclists than for car drivers. The risk of motorcyclists to be seriously injured is surpassed by the high risk of moped riders. Car drivers, cyclists and pedestrians have a lower risk of serious road injury. Figure 3. The fatality rate and the serious injury rate (casualties per distance travelled) in the Netherlands for different modes of transport, averaged over 5-year periods. Sources: CBS (mobility data), BRON (data on road deaths and injured), LBZ (data on serious road injuries) and SWOV (assessment of the number of serious road injuries). [i] The serious injury rate data is only available up to 2009 because after this year the distribution of serious road injuries by various modes of transport is not reliable. Which motorcyclists are most frequently involved in crashes? Motorcycle crashes are more common for some groups than for others. Below we discuss the groups most frequently involved in motorcycle crashes. The majority of the motorcyclists killed in 2015 was younger than 50 years (81%). The largest group are the 40-49-year-old motorcyclists (almost 30%). This is also relatively high; in all modes of transport together 'only ' 8% of the road deaths is in the age group 40-49 years old. We can also compare the number of road deaths among motorcyclists with the possession of motorcycles in the different age groups (Table 1). It is then remarkable that the number of road deaths among the young novice motorcyclists (18-24 year) is disproportionate (12.8%) relative to the motorcycle possession in that age group (3.1%). Also among 25-29-year-old motorcyclists there are relatively many road deaths. The motorcyclists in the age group 50-59 years old, on the other hand, form a very small share (10.6%) relative to the motorcycle possession in this age group (30.8%). Note that it is not clear what above comparison says about the risks of a certain age group. It may well be that the younger motorcyclists less often possess a motorcycle, but do ride (on someone else’s motorcycle). For reliable statements about risk, we would need to compare the number of crashes and the kilometres travelled per age group. Unfortunately, that information is not (reliably) available. However, there are indications (from international studies) that young motorcyclists, like young car drivers have a relatively high risk ; and also engage in risk behaviour more frequently  . Table 1. Age distribution of motorcycle owners and road deaths among motorcyclists; the numbers and shares in the year 2015. In 2015, 98% of the road deaths among motorcyclists were male (46 men to 1 woman). In the past decade between 90 and 100% of the road deaths and serious road injuries among motorcyclists in the Netherlands were male  . The main explanation lies in the fact that men generally ride a motorcycle more and more frequently than women, although the share of female motorcyclists in most OECD countries is on the increase . Studies from the United States and New Zealand indicate that motorcycles with a greater cylinder capacity (from 500 cc) are more frequently involved in (fatal) crashes than motorcycles with a cylinder capacity of 250 cc or less  . This may have more to do with the characteristics of the rider who chooses for this motorcycle than with the cylinder content . The researchers   found that the riders of the heavier motorcycles more frequently broke the speed limit and more frequently were under the influence of alcohol. In questionnaire studies in the United Kingdom , riders of heavier motorcycles more frequently reported to enjoy higher speeds . This was also found in Taiwan . The American researchers Savolainen & Mannering  found that in general riders of heavier motorcycles more often show risk behaviour, including driving without motorcycle helmet and protective clothing. As yet no research into the relationship between the type of motorcycle and the crash involvement of the rider has been done in the Netherlands. Furthermore, 82% of the motorcycles in the Netherlands have a cylinder capacity exceeding 500cc (Figure 2 in the question How much are motorcycles used in the Netherlands?). What is the expected effect of an age reduction for the category A1 (up to 125 cc)? At present, the minimum age for the A1 licence category (for motorcycles with a cylinder capacity of up to 125 cc) is 18 years in the Netherlands. The European directive on driving licences allows a minimum age of 16 years for this category. A reduction of the minimum age is expected to lead to an increase in the number of casualties. This is supported by the experiences in Germany, where the minimum age for light engines was lowered in the 1990s. The group of 16- and 17-year-olds (who rode a motorcycle up to 125 cc) turned out to have by far the highest risk: more than 150 motorcyclist road deaths per 100,000 motorcycles, compared with about 75 deaths per 100,000 motorcycles in the age groups 18-21 and 21-25 year-olds (regardless of the cylinder capacity) . For more information see the archived SWOV Fact sheet Category A1 (to 125 cc) of the new motorcycle driving licence. What are the causes of motorcycle crashes? Usually it is a combination of several factors that leads to a traffic crash. Below, we will discuss some frequently mentioned causes of motorcycle crashes. Approximately 50% of all serious and fatal motorcycle crashes in the Netherlands are collisions between a motorcycle and a car and 40% are single vehicle crashes (a crash in which no other road user is involved) . The remaining 10% of the crashes are collisions of a motorcycle with a different road user (cyclist, pedestrian, other motorcyclist, etc). A large-scale European study (MAIDS)   found that crashes involving a motorcycle and a car mostly occur because the motorcycle is not noticed. The MAIDS study made a thorough analysis of more than 900 crashes in five countries (France, Germany, Italy, Spain and the Netherlands) in which a powered two-wheeler was involved. In more than 36% of the cases the driver of the other vehicle had failed to notice the two-wheeler; in 12% of the cases it was the other way round and the rider of the two-wheeler had failed to notice the other vehicle. It must be noted that the data that was used in the MAIDS study (collected in the period 1999-2000) are now obsolete. More recent crash statistics suggest that motorcyclists are particularly often involved in conflicts with oncoming vehicles that turn off, or with vehicles that entering the main road from a side road onto a main road  . These are mainly priority violations committed by a driver . The extent to which speed plays a role in the development and impact of motorcycle crashes in the Netherlands is not precisely known. In theory a higher speed has a negative effect on risk of a crash. A higher travel speed leads to a greater impact in the event of a crash, and, consequently, to more serious injury. At higher travel speeds, there is less time to process information and react accordingly; also the stopping distance is longer. This reduces the possibility to avoid a crash. More information is given in the SWOV Fact sheet Speed and Speed management. Based on international studies the OECD/ITF working group ' Safety of powered two-wheelers ' concludes, that speed is a bigger factor in motorcycle crashes than in car crashes . Walton & Buchanan , for example, found that in New Zealand the speed used by motorcyclists at a T-junction swas about 10% faster than that of the other traffic; and that they violated the speed limit 3.4 times more frequently. In the United States it was found that in 2011 35% of all motorcyclists who were involved in a fatal crash were violating the speed limit at that moment . Drivers were violating the speed limit in 22% of the fatal crashes. A motorcycle is a balance vehicle, which makes riding it more complex and increases the risk of crashes . 40% of all serious and fatal motorcycle crashes are single vehicle crashes . One of the main causes of single vehicle crashes is that the rider loses control of the vehicle . A technical vehicle problem is rarely the cause of a crash . Infrastructural factors such as a cluttered or unclear design, improper use of materials and poor road maintenance play a demonstrable role in 8% of the motorcycle crashes . For several reasons road features can present problems for motorcyclists, especially in combination with humidity. Speed humps, markings, grates and drain covers may cause problems as they get slippery in damp weather or create differences in level on the road, which affects stability. Furthermore, sand on the road is more dangerous for a two-wheeler than for a car . A guard rail is designed to prevent vehicles from entering a danger zone next to the roadway. 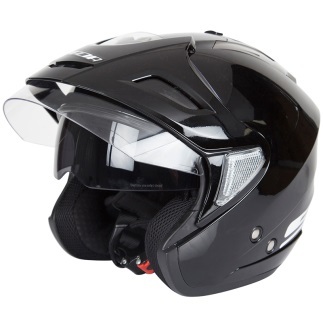 For cars, but also for motorcycles, these are very effective in the prevention of head-on collisions with objects or road users travelling in the opposite direction. However, for motorcyclists guard rails themselves can also be a risk. If a motorcyclist hits an (unprotected) guard rail in a crash, it can lead to serious injuries . Crashes with guard rails and other road screenings play a role in 2-4% of the fatal motorcycle crashes in Europe . In General, each unprotected obstacle is a danger for motorcyclists, even if they are classified as 'crash friendly' for car drivers (light poles, shrubs, small trees, road signs). Motorcyclists find ‘Cable barriers’ the most dangerous roadway separations , but research found no difference in crash severity between ‘cable barriers’ and other guard rails . Why are motorcycle crashes more frequent in spring and summer? In the spring and summer months (April-September) there are more road deaths and serious road injuries among motorcyclists than in the autumn and winter months . This is not so much due to with a higher risk in spring and summer, but is explained by the fact that during this period the motorcycle is used more frequently . Does the visibility and conspicuity of the motorcyclist play a role in crashes? In part of the motorcycle crashes it is probably a contributing factor that other road users do not or not timely notice the motorcyclist. It is often assumed that this is due to the fact that motorcycles are less visible and conspicuous than other, mostly larger vehicles. In 50% of the motorcycle crashes in the Netherlands another road user is involved (usually a car driver) . Often the driver does not give the motorcyclist right of way. Drivers who were involved in such crashes usually report to have looked, but not to have seen the motorcyclist. The term for this is 'looked-but-failed-to-see'  . Visibility research in Israel  has shown that 90% of the motorcyclists were seen in good time during the day, whereas the percentage dropped to 35% in twilight. Even if people were told to look for motorcyclists in video images, 13% of motorcyclists were still not timely noticed. Can visibility be improved with fluorescent vests or (special) lighting? De Craen et al. conclude that it is not so much light or reflective clothing that can increase the visibility of motorcyclists, but particularly the contrast with the environment. Research by Gershon, Ben-Asher & Shinar  came to a similar conclusion. In an urban environment with a varied and multi-coloured background a motorcyclist was more conspicuous in white or reflective clothing, and in a rural setting, where the background mainly consisted of a blue sky, the motorcyclist wearing black was more easily noticed. Research into alternative light systems for motorcyclists, such as the T-configuration of Rößger et al. and the flashing light system of Gershon & Shinar , have shown that motorcyclists using the alternative light systems were more rapidly recognized as such, but that this effect disappears over time. What is the safety effect of the motorcycle helmet? A review of 61 international studies shows that wearing a motorcycle helmet reduces the risk of a fatal motorcycle crash with approximately 42%, and the risk of severe head injury with about 69% . Since 1972, it is mandatory for motorcyclists in the Netherlands to wear a helmet. This mandatory helmet use was generally accepted after its introduction and most motorcyclists comply with it. 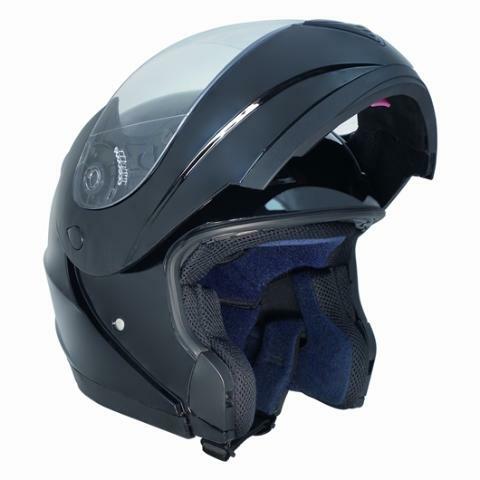 Approval requirements for motorcycle helmets are laid down in European Regulation ECE R22-05, in which minimum requirements are laid down for shock absorption, penetration resistance, stiffness, protruding parts, surface friction, chin strap and risk of detachment in a crash. KNMV examined whether there are differences in head injury when using different helmets (see Figure 4): full-face helmet, modular (flip-up) helmet, and open face helmet . 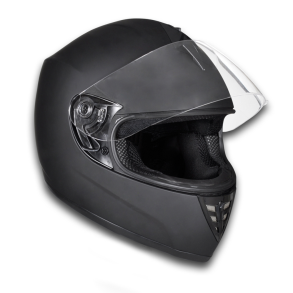 The injuries of motorcycle riders wearing the three helmets were similar, but a closed helmet had a small advantage over a helmet which leaves the face free, such as the open face helmet. While wearing closed helmets, crashes more frequently resulted in bruises to the neck and whiplash, and while wearing an open helmet crashes more frequently led to injuries to head and face. Figure 4. A full face helmet (left), a modular (flip-up) helmet (middle) and an open face helmet (right). What is the safety effect of protective clothing? Wearing special motorcycle pants and boots reduces the risk of serious injuries to the lower body with 68%, and wearing a motorcycle jacket and gloves reduces risk of injuries to wrists and hands with 48% . Although wearing motorcycle clothing is not mandatory in the Netherlands, this is generally done all the same. A survey among visitors to the Motorcycle Trade Fair shows that 100% of the motorcyclists wear a special motorcycle jacket, 98% wear gloves, 96.4% wear special motorcycle pants and shoes, and a special back protector was worn by 45% of the motorcyclists. .
Few studies have found a positive effect of advanced rider training on motorcycle safety. A meta-analysis of Kardamanidis et al. of motorcycle rider trainings (advanced and regular) shows that it is not possible to draw firm conclusions about their effects on the crash rate, fatality rate and violation behaviour. Kardamanidis et al. note that in many of these studies motorcyclists were not randomly selected for groups with or without training. It is therefore possible that the groups that were coached in the advanced rider training was already different (safer, more experienced, etc.) than the groups that were not coached. For a Dutch advanced rider training (VRO) for motorcyclists a positive effect on safety was found. This one-day course offered by the KNMV[i], with a practical component on the public road, coaches motorcyclists in anticipating, recognizing and analysing potential hazards in traffic. Following this VRO had a short term (a few months) positive effect on both safe driving habits as hazard perception. In the long term (one to one and a half years) there was still a positive effect on safe riding, but the effect on hazard perception could no longer be established . The use of ABS on motorcycles, has reduced the number of motorcycle crashes and, consequently, also the number of road deaths and serious road injuries among motorcyclists  . ABS stands for Anti-Lock Braking System, a system that prevents the wheels from locking in case of heavy braking. When a vehicle with two wheels brakes and the front wheel locks up, the stabilising gyroscopic effect of the turning wheel disappears and the motorcyclist runs the risk of falling or skidding . In Europe the effectiveness of ABS on motorcycles has been measured by, among others, Rizzi et al. . They established a reduction in serious and fatal crashes by 34% in Italy and 43% in Spain and Sweden. In 2008, there were 22% fewer damage claims per motorcycle with ABS in the United States, and motorcycles with ABS had 37% fewer fatal crashes per 10,000 vehicle years, compared with the same types of motorcycle without ABS . The disadvantage of this type of comparison studies is that it cannot fully correct for the fact that certain motorcyclists will choose ABS when they purchase a (new) motorcycle, whereas others will not. It could therefore be the already safe motorcyclists who choose ABS. The US study of Basch, Moore & Hellinga , however, indicates that it is not necessarily the safer motorcyclists who opt for a motorcycle with ABS. The study found no difference between the motorcyclists with and without ABS in the number of insurance claims that they annually made for their car. Which (intelligent) vehicle measures can further increase motorcyclist safety? Measures to increase the safety of motorcyclists are especially considered in the technical/intelligent vehicle developments (see examples below). Often inspiration is sought in vehicle developments for cars. Adapting ITS systems for cars to motorcycles, however, is difficult  . An intelligent system must for instance ‘accept’ that a motorcycle in a bend has a smaller angle than a car. Digital conspicuity means that vehicles can communicate with each other in traffic, so that car drivers are warned about the presence of a motorcyclist on the road. SAFERIDER  attempts to integrate different intelligent warning systems already used for cars (Speed Alert, Curve Speed Warning, Frontal Collision Warning and Intersection Support) on motorcycles. This means that they will be adapted for motorcycles in such a way that the systems work correctly and do not obstruct the motorcyclist while riding. The project is promising, but as long as not (almost) all vehicles on the road have such a communication system, the effect on road safety is limited. The crash risk of motorcyclists without a communication system might even increase, if car drivers rely too much on their warning system and therefore fail to detect motorcycles . Powered two-wheelers have more complex dynamic movements, which makes automatic registration of a serious crash different (and usually more difficult) than for cars. - the necessary communication between casualty and the rescue workers who are on their way to the crash location. Several researchers have investigated the possibilities of airbags on the motorcycle   . However, a motorcyclist is positioned differently on a motorbike than a driver is positioned in a car; moreover, the forces on a motorcycle are different. It is therefore difficult to determine the shape of the air bag (so that it does not injure the rider) and to determine the moment at which the air bag must be activated.
. CBS (2015). Verkeersprestatie Kilometrage Motorfietsen. Personal communication. Centraal Bureau voor de Statistiek CBS, Den Haag. SWOV (2017). Motorcyclists. SWOV Fact sheet, April 2017, The Hague.